Home and building performance involves more than HVAC. ACCA is the contractors' resource for whole building energy efficiency solutions. Gone are the days when a contractor could install a box and move on. Now homeowners and building owners want to know how to reduce their carbon footprint, how to lower their energy bills, and how to improve overall comfort and health. ACCA members are at the forefront of this dynamic market, because they already have the right expertise, and the right relationships in place, to promote true energy efficiency. ACCA offers exclusive member resources to help contractors enter this market, grow this market, and dominate this market. ACCA Members: Check out these interviews with top building performance contractors from IE3 Magazine, archived for your listening pleasure and enrichment. ACCA wrote the standard on Home Performance! 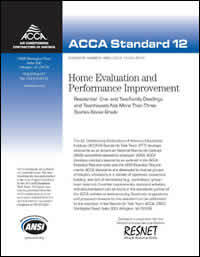 ACCA-12 QH (Existing Home Evaluation and Performance Improvement) is the industry standard for assessing deficiencies in existing home performance and making recommendations for performance improvements. This standard outlines exactly what is to be included in an audit, how to identify opportunities for improvement, and how to meet improvement objectives. Download the ACCA QH standard here. It's free! How do I get my technicians "on board" with home performance? How can I add "whole house" to my HVAC marketing? How can I use financing programs to make home performance accessible to all of my customers? What are the "best practices" for entering this market -- and what are mistakes I should avoid? What are the legal pitfalls of "green contracting"? What the heck are "zero energy buildings"? Is that really possible? ACCA members receive a special newsletter featuring articles and resources related to Building Performance. Check out archived articles from the newsletter here. The Building Performance Council is an advisory committee of member contractors who offer insight and advice to ACCA's staff and Board of Directors on issues related to building and home performance. They help identify industry issues and suggest ways in which technical staff might support contractors on those matters through standards and codes. Current chairman of the BPC is Rob Minnick of Minnick's, Inc. He also serves as an ex officio member of ACCA's Board. The ACCA Conference features a special program track on Building Performance, focused exclusively on both residential and commercial home and building performance. Top contractors share real techniques for expanding into energy services, improving your customers' lives, and growing your profit margins.